The year 2017 is here and it’s a great time to re-brand, renew, and reinvest in your company’s image. It is always good to have both short-term and long-term goals when it comes to your company’s packaging. Your packaging goals may involve upgrading to more advanced or fully customized packaging, changing your logo or packaging design, or incorporating new packaging products into your program. Making changes to your packaging can provide a fresh look and renewed confidence in your business. If you will be exploring new packaging options this year, be sure to keep some of these popular packaging trends in mind. Morgan Chaney can help you navigate your custom packaging options and find solutions that are best for your business and your budget. The materials you choose for your custom packaging can be just as important as the design and printing. Materials provide a sensory experience for customers; where they can see and feel the texture and dimension. These small chocolate boxes were manufactured with a very unique multi-dimensional shimmer paper in a cocoa color and a white color. It’s hard to tell from pictures, but this paper is embedded with a gorgeous shimmer that adds visual texture and depth to the boxes. The paper has a very smooth but tactile feel which makes the boxes feel extra luxurious. A foil hot-stamped logo adds another dimension of texture and visual intrigue to the boxes. 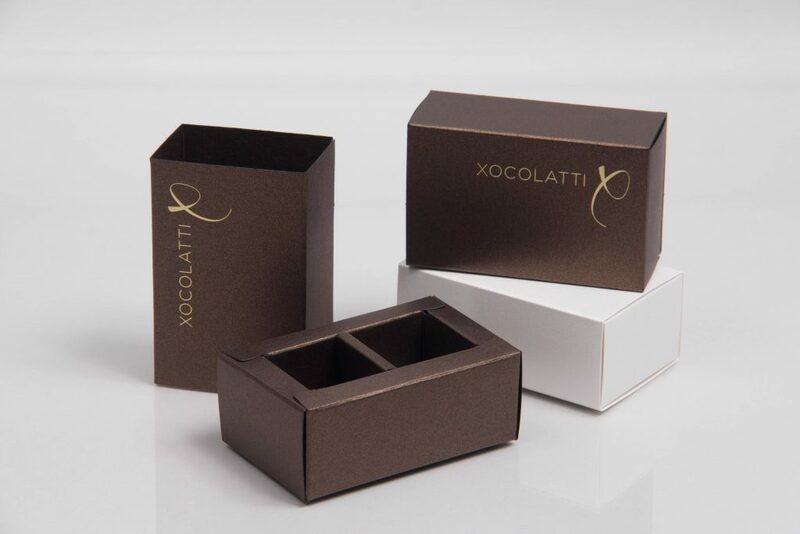 These small boxes are a perfect example of using an enhanced material to draw interest and provide a unique packaging experience for a luxury product. Materials can enhance the look and feel of your packaging by providing interesting textures, visual dimension, and contrast. E-commerce business is strong and always growing as many large retailers are closing stores in favor of selling more merchandise online. As e-commerce businesses establish their roots and increase their revenue, custom packaging becomes an object of interest. With e-commerce packaging, emphasis can be placed on the shipping boxes and mailing envelopes as well as the interior packaging and accessories. 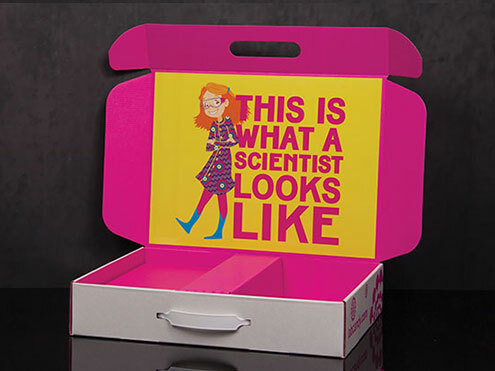 With so many boxes being delivered directly to people’s homes every day, there is an increased opportunity to stand out using custom packaging. Our previous blog post on custom subscription box packaging explains more ideas and techniques for e-commerce packaging. The overall ‘unboxing’ experience of online retail is very important in making customers happy and more likely to order again. One of the advantages of e-commerce packaging is that you can create custom elements and accessories on a limited budget if you’re just starting out. Established companies have more flexibility when it comes to creating innovative custom printed e-commerce boxes and packaging items. If you sell any merchandise online, 2017 is the year to enhance your custom e-commerce packaging to ensure you stand out among a sea of cardboard boxes. 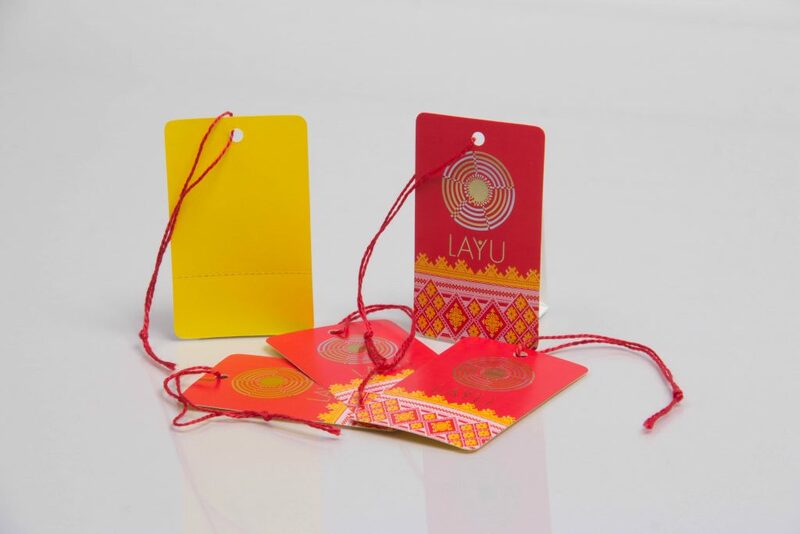 These custom eurotote shopping bags and custom hang tags made for LAYU boutique feature an intricate and colorful design that is captivating and memorable. Bold and intricate patterns like these are becoming very popular in packaging, both in colors and black and white. 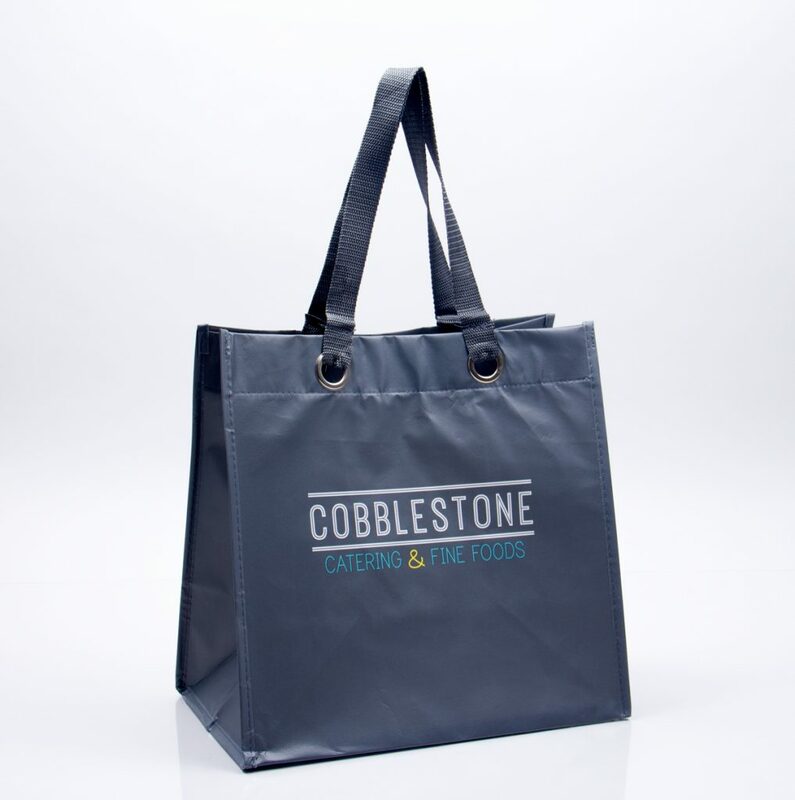 Customers will love using these bags and are more likely to reuse and keep the bags because they were designed with quality construction and an aesthetically pleasing design. We also love that they use different colors for each size bag, rather than having the same exact colors and design on every bag. 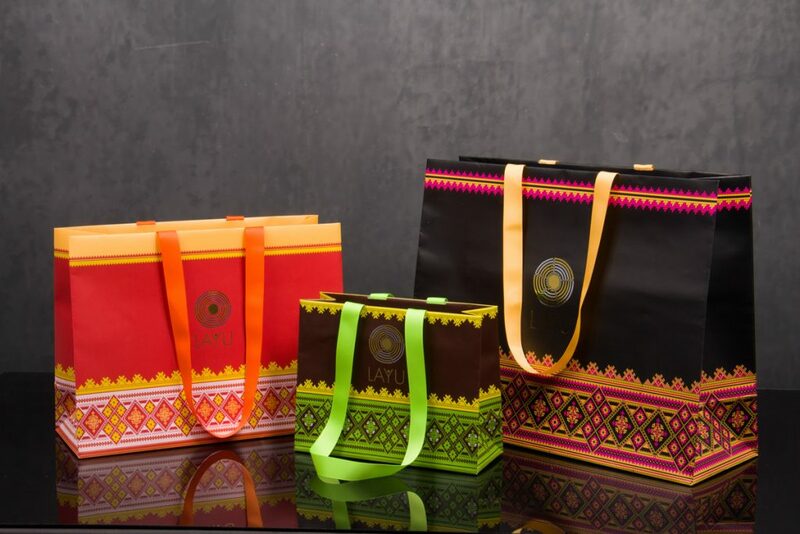 All of these bags feature the same geometric bottom design and foil hot-stamped logo, but they use different color schemes and top trim designs for the different size variations. The custom printed hang tags use the same design and hot-stamped logo to create a complete packaging look for this company’s retail merchandise. 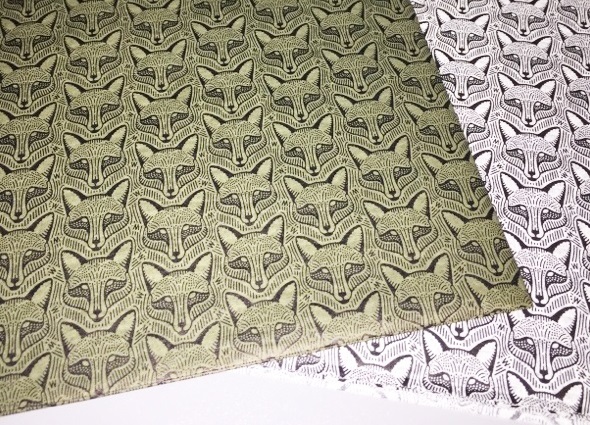 This custom printed tissue paper for a winery features a unique repeated fox print that provides an interesting visual experience. The contrasting black and white and black and gold patterns are a beautiful addition to this packaging program. A repeating pattern with contrasting colors like black and white is sure to capture the attention of consumers and entice them to find out more. The contrasting colors and repeating design provides a visually appealing look that can enhance any packaging. This design trend works well for tissue paper, but also looks great on boxes, bags, or product packaging. Gray has taken over the design world as the new preferred neutral color. We have noticed an increase in gray packaging and gray printing orders recently coinciding with this trend. Matte grays are particularly popular, but there are many gray options available including different shades of gray and different gray undertones. There are different ways to print custom packaging with gray including metallic or foiled gray hot-stamping, gray ink printing, or digital printing. 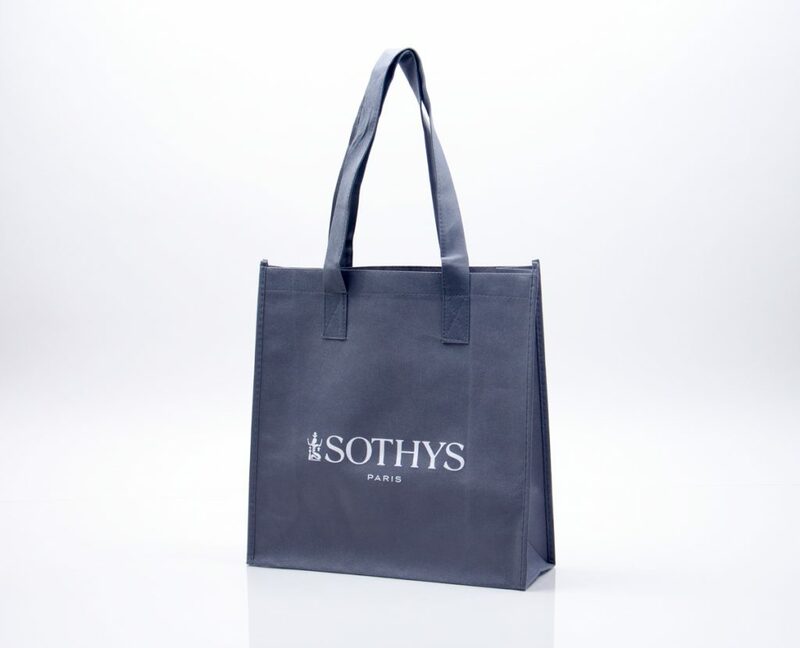 White or silver printing looks simple and sophisticated on a gray shopping bag, while pops of color can make your gray packaging look more fun and whimsical. Gray is a timeless neutral color that can provide contrast and depth to your packaging without being too dark or plain. Pantone announced “Greenery” as their color of the year for 2017. 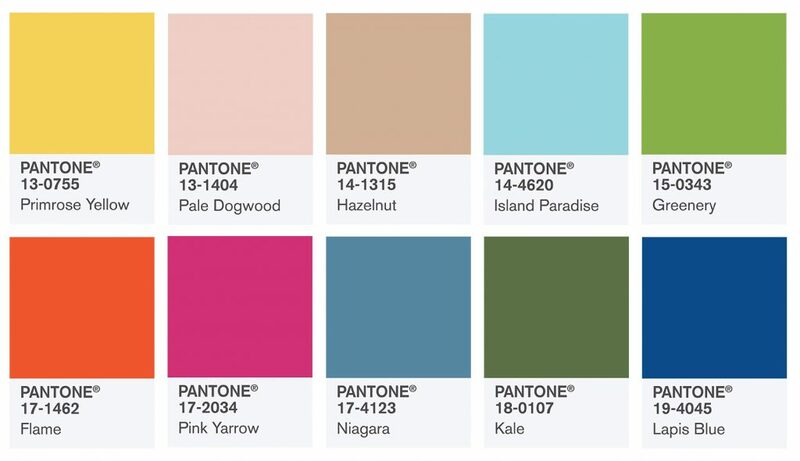 They also produced a Spring fashion color report with 10 colors that are “A Mixture of Vitality, Relaxation and the Great Outdoors”. These colors might provide inspiration for custom packaging design as well as fashion on the runway and interior decorating. Pantone’s mixture of blues, greens, and brighter colors encourages a colorful year for the design world. These colors point to a trend of design that is colorful, yet natural and ‘earthy’ in a way. Pantone colors can be used with certain printing methods for custom packaging, making it easy for businesses to represent their brand’s signature colors accurately on their packaging. Contact us today to start off the new year with a brand new perspective on custom packaging and design. Our packaging consultants can help you navigate your custom packaging options and help you start the new year with a fresh new look!